The holidays are here! Now that Halloween has passed, the topics all around the blog world will be dominated by holiday themed ideas. Get ready! I’m feeling the Christmas spirit already and can’t wait for the decorating to begin. I was out of the country last November, traveling in New Zealand and Australia, which left little time for decorating and celebrating so I’m feeling the excitement early this year. I’ll be sharing DIY projects and ideas throughout the month in anticipation of the holiday season but before I jump in I wanted to share about a kitchen remodel I’m working on right now. 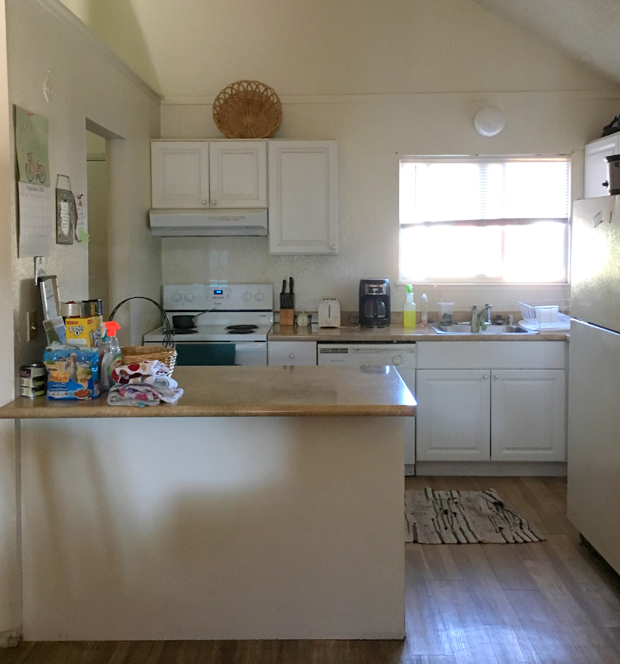 As I’ve done many times in the past, this year I’ve partnered again with a local non-profit called the Committee on the Shelterless to give a kitchen used for transitional housing a makeover. I’m rushing to get it ready for move in before 2017. I have a plan in place and I’ve lined up sponsors for the project and I’ll be sharing the makeover in December. It’s a kitchen with white cabinets that thankfully are in great shape but the rest of the kitchen is getting a fresh look. With white cabinets, I look for ways to keep a kitchen timeless and for this project I’m using black in small doses as an accent. White kitchens are here to stay, and one way to give them a touch of classic black without painting cabinets or replacing tile is by introducing it in smaller doses. You can’t go wrong with black or oil rubbed bronze lights, they add drama when suspended in a mostly white space. Black looks striking with a white porcelain sink and it’s perfectly fine to pair a black faucet with a stainless sink too. Honed black granite, soapstone, and quartz are all available in black and when installed as a countertop against a sea of white cabinets, they will introduce dramatic contrast to a kitchen with stainless steel appliances. The nice thing about a black/white/nickel or brass palette is the space will never go out of style and you can introduce any colors with your accessories (cookware, towels, flowers, etc.). I’m excited to reveal the kitchen for COTS next month, you can catch a glimpse of the “before” here. Adore the black countertops and the open wooden shelving on brackets. fab post, Kate! I love the look of black benchtops, but have you ever tried to live with them? A nightmare! Every little mark and crumb and drop and smear seems to be magnified. I didn’t think anything could be worse than stainless steel, but this is it. Fab – love the big downlighters!! Oh girl, I am so into this. I have been craving the contrast for sure! About 5ish years ago everybody was painting everything white, so I went ahead and spray painted everything white. And I loved it for several years, but I am eager to add doses of black back into my house. I just did my kitchen all white, and I did oil rubbed bronze light fixtures. Love! Black can be very pretty in the kitchen. I think a sharp snap of black really livens up an interior. The kitchen with the black brackets and herringbone subway back-splash is Canadian Designer Sarah Richardson, not Stacy Branford as you have cited. I have a copy of her book “Sarah Style” with this fabulous kitchen in it. Here is the Houzz link http://www.houzz.com/projects/334093/sarah-richardson-design. I am enjoying reading your Blog. You are very creative, smart and hard-working. Thanks for the tips.